ChimerMarker® software is a biologist-friendly genotyping program with additional tools to assist researchers with DNA fragment analysis. 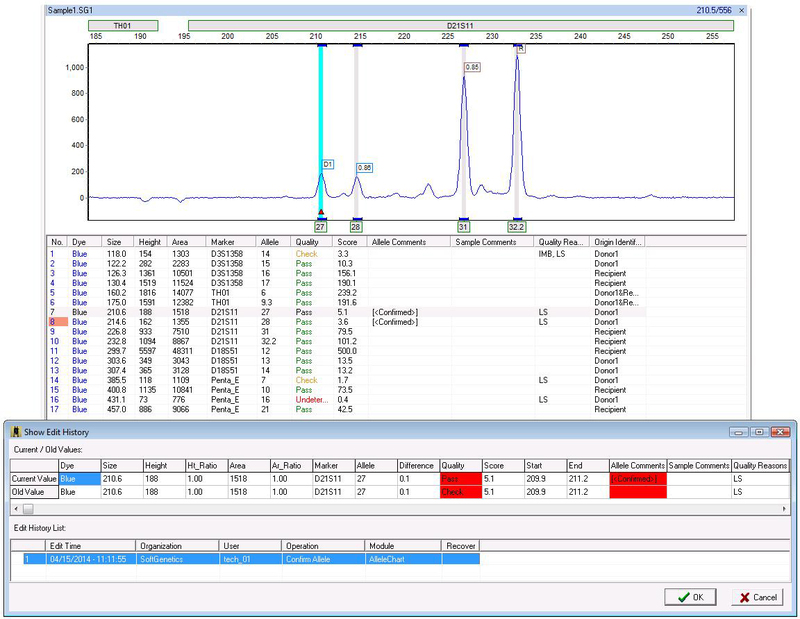 The program is compatible with all capillary electrophoresis instruments (ABI®PRISM, Beckman-Coulter®, MegaBACE®) and is a powerful alternative to GeneMapper®, Genotyper™, GeneScan®, CEQ™ Fragment Analysis Software. 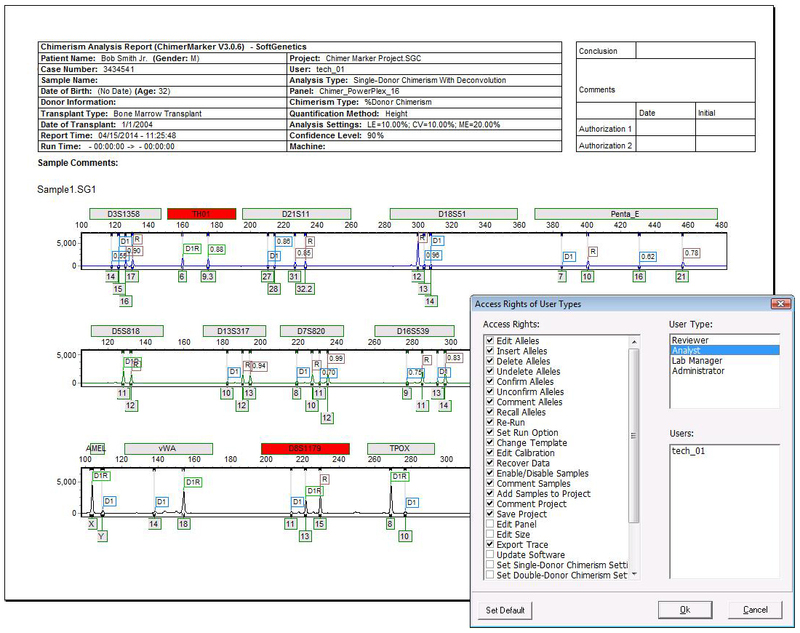 In addition to accurate size calling algorithm options and a flexible panel editor, ChimerMarker software includes User Management and Project Comparison Tools. User management provides control of user access rights, automatically generates an audit trail of all edits to genotyping projects and is used to customize the Organization and Operator fields in the header of comprehensive chimerism reports. The Project ComparisonTool provides researchers with a linked comparison of two replicate projects. It is an excellent validation tool for instrumentation, analysis parameters or chemistries; providing a peak by peak comparison and identifying any differences between the project results. Uses include establishing and comparing analysis parameters, validation studies for instrumentation or chemistries, and ensuring consistent calls of edited alleles (especially beneficial for long term projects to confirm that edits/comments are consistently applied). Figure 1: User management provides a complete audit trail of any edit made by the authorized user; including the time, organization, user ID, operation performed and current and original values. 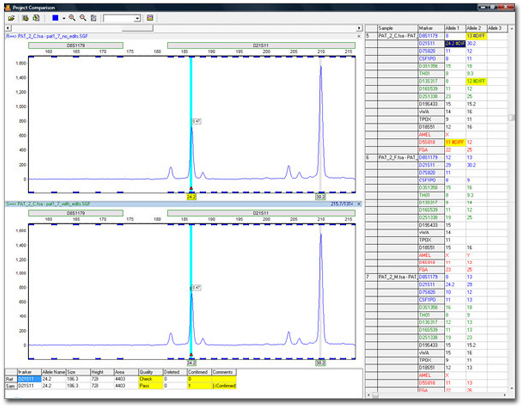 Figure 2: This enlarged header displays information from user management (Lab name and Identification of the individual that performed the analysis. Access rights are selected for each user and provide assurance that authorized individuals have access to the appropriate functions in the software. Figure 3: The peak-by-peak comparison is summarized in the table at the right. Results that are in agreement with each other are not highlighted (as seen here with samples 6 and 7 in the table). Any differences between the samples will be highlighted in the tables and electropherograms. By using the scroll bar to scan for yellow highlighting, the reviewer or supervisor can quickly zoom in on the areas of interest by double clicking on the yellow cells.